Only in Australia can a child or parent observe kangaroos, koalas and crocodiles in their natural habitat. But, for safety’s sake, just from a distance. However, one of the best ways to learn about and explore Australian wildlife is through interactive education. Although, Australia has various prospects to visit different wildlife facilities, there are other opportunities for learning about wildlife. In fact, one of the most rewarding and exciting adventures is when the wildlife presentations come to you. Truly, interactive education can be brought to various facilities like schools, shopping centres, country shows, festivals and corporate events. As well, there are field trips available for most all sized groups. With education that is interactive, a child gets hands on experience plus they are able to hold, touch and experience wildlife close up. In addition, the presentations are not just ordinary animals but unique wildlife native to Australia. Some of the unique animals you will see at Black Snake Productions include a large variety of snakes, lizards, tree frogs, various birds such as parrots and masked owls, kangaroos, alligators, painted turtles and even the blue tongue lizard. In actuality, the private zoo is home to more than 300 native animals of Australia. Children can even learn about snake safety and the difference between venomous and non-venomous snakes. As well as, children learn how to respect animals in the wild and the importance of protecting their environment. What is more, the hands on experience with Australian wildlife give a child a different perspective than what they would find in a book or a movie. Children learn about the animal’s habitat, the conservation and preservation of wildlife, the ecosystem and many other educational and fun filled facts. Moreover, the many benefits that come with animal interaction are outstanding. The hands on interaction not only are proven to be educational but are beneficial for mental and emotional well-being. Black Snake Productions is all about providing educational and fun services to both children and adults alike. As well, with full insurance with working with children, complete safety is guaranteed. 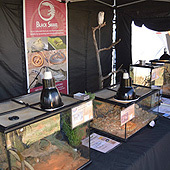 For over a decade, Black Snake Productions has delivered entertaining interactive wildlife display and presentations to various organizations and events including schools and various festivities. In addition, the entertaining presentations are suitable for a large range of audiences. Moreover, Black Snake Productions believes that with a growing mindfulness on sustainability and our endangered animals and environment, interactive education is the key to preserving our wildlife for future generations.